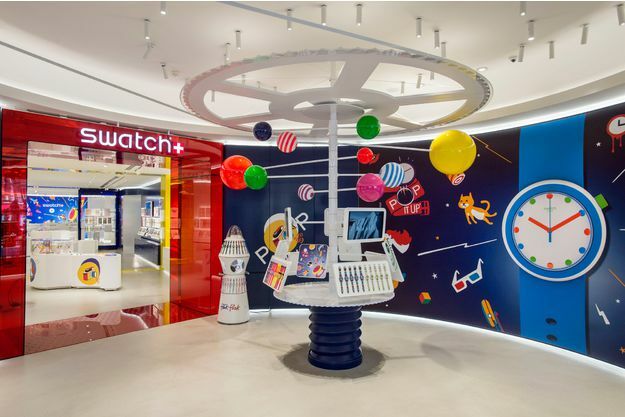 After months of work, the Swatch Megastore located at 104 Avenue des Champs-Elysées, Paris re-opened with a new “Swatchy” concept. It is a concentrated mix of color, fun, energy and positive attitude. The new space hosts all of the new Swatch collections and the latest exclusives. One of the key highlights in the new store is a futuristic featured space called The Rotunda. Utilizing Matrix Frame silicone-edged fabric graphics and non-lit aluminum extrusion frames, Paris-based Metropole produced the key graphics for “Swatch Machine”. In this futuristic facility, the latest watch collections are in the spotlight thanks to a graphic concept combining colored planets and a clockwork mechanism. The brightly colored and vibrant watch graphics continue throughout the remainder of the store.